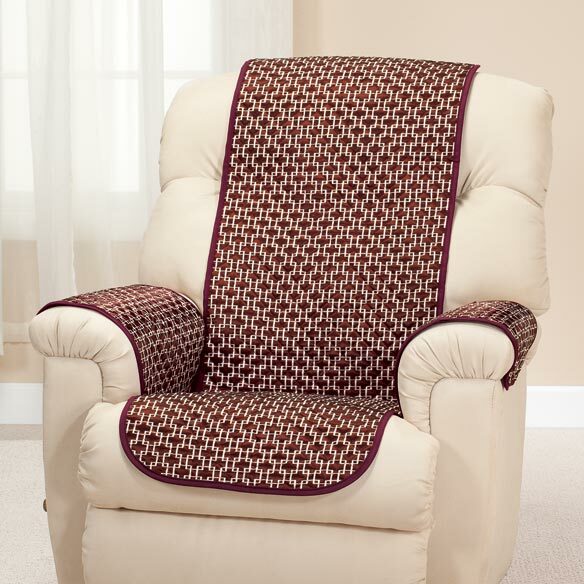 Get 2 designer looks with a reversible chair cover 3-piece set in quilted, easy-care polyester. 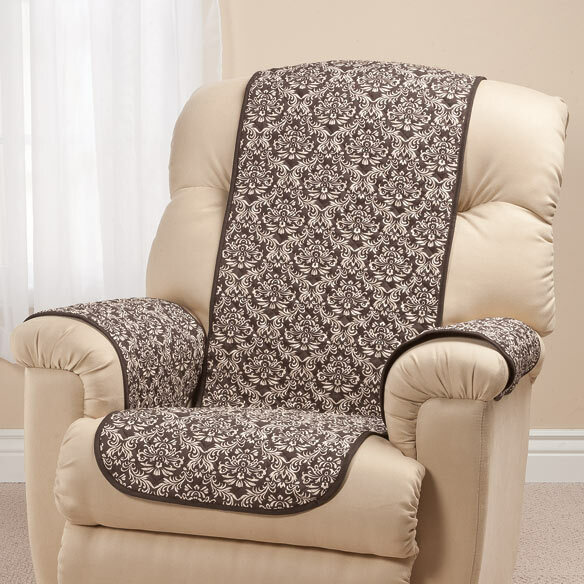 Great for smaller recliners and wing chairs, it stays in place with easy fabric ties that wrap around back and top of chair. By OakRidge™. Each measures 60"L x 19"W and includes two 20"L x 16"W arm covers. Polyester. Hand wash or machine wash cold with like colors. Imported. 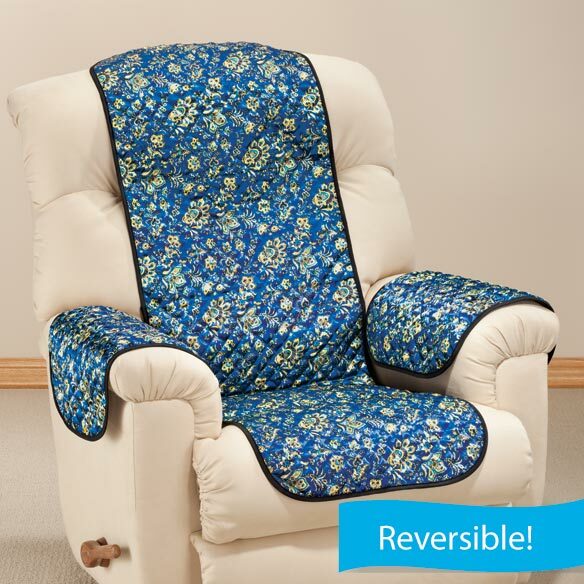 Help keep arm pieces in place with easy-to-use upholstery locks (sold separately; see item 341665 for details). 100% polyester. Hand wash or machine wash cold with like colors. I love the fact that you tie it to loveseat so it don't move and stays in place. Looks nice. Great chair covers. Better than the one piece huge one. Just wish you could make them stay in one place. I'm going to work on that one. Many thank. Love the color and the reversable print. Love my cover. It is silky so I slid out easy. It does not wrinkle up. Looks great on my new chairs and will keep them clean and fresh longer. Wish they came with the pins to keep them in place so I do not have to reposition them every time I get up. 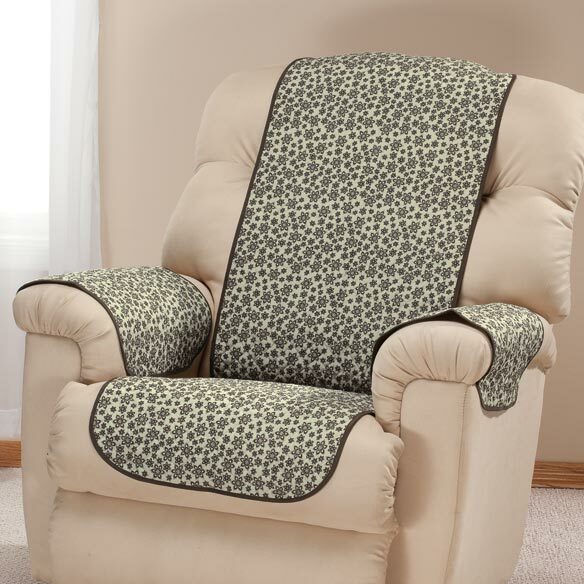 The covers are awesome for a new recliner. My biggest complaint is that the 1 (solid) piece (back and seat) cover does not stay in place. 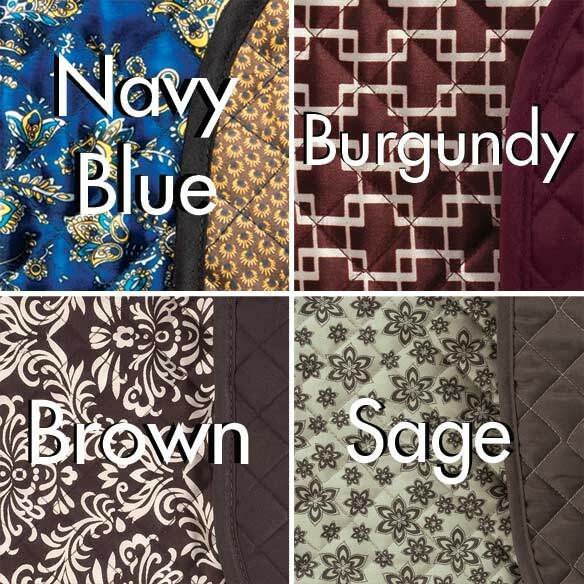 I don't want to put Velcro on my new recliner, therefore, I am trying to figure out how to keep the covers in place without ruining my new suede/leather recliner. Any helpful hints??? the material is very slick, so slippery it doesn't stay in place. not comfortable to sit on. too small, doesn't cover chair. These covers do not "stay in place" as advertised. They slip and slide with each movement. Actually I don't recall any straps, it's been quite a while ago that I had ordered these. As soon as I saw them I returned them. The color wasn't true to description, the material was thin, just didn't care for the product at all. Didn't fit my chair very well, no way to fix it in place. I did not like your shipping/handling and processing fees. $10 total. Seems like you're nickle/diming the customer. I would not liking buy from your store again. Put it on my recliner. Looked good and then I sat on it. It immediately slipped from the back unto my head. No matter how many times I adjusted it, it continued to slip. I gave up and considered my $25.00+ a bad investment. The chair cover was to small for the chair and was returned for a refund. Am now waiting fo the refund. This chair cover helps to keep the chair clean longer. Good prices and items not easily found. Sorry you do not accept Canadian orders, or ship to Canada. Had to use my sister's U.S. address and she will have to mail items to me. This will keep me warmer. To cover a chair. Really was looking for a dark green like Hunter Green. Settled for the Burgundy. tO KEEP THE CHAIRS CLEAN. Hubby just got a new recliner and I'm trying to keep it nice. We.re just trying your merchandise and delivery time. 96 year old will sit on it! My current one is raggy and the color fits my room and the price is reasonable. Wife wanted to protect the ware and tare on the chair. I liked the style and color choice. Need a chair cover to protect the seat. I need to protect my furniture. I USE FOR MY CHAIR, IT IS VERY COMFY FOR SUMMER. Needed a cover for light beige chair; liked the idea of print and solid. It fits my house style perfectly and makes my wife happy. What better way to start the new year. Before I order from any catalog I go on line to review customer comments. I like what I have read & especially your follow up. Looking forward to doing business with you. My wife & I are 82 & married 62 years next month thanks to Jesus Christ. Bought a new recliner and wanted to protect it. The fabric on the arm of my chair is threadbare and this will cover it nicely, I hope. I have a dog that loves this chair. Would like to protect my chairs. I have cats that love to sleep on the chairs at when possible. My dachshund is always jumping on recliner, to protect the recliner. I liked the look of it. on the reversible cover how does it stay in place? Does it just hang over the back of the chair or is there a strap to hold it in place? BEST ANSWER: The chair cover just hangs over the back. We found it difficult to keep it in place. However, the fabric of the one we bought was a satin type and therefore a bit slippery. A fabric of a different type may work/cling better. Thank you for your question. This item does not include a strap to keep it in place, it simply hangs over the chair in place. We hope this information will be of help to you. There is no strap. Doesn't stay in place but still worth the money. Plus they are very nice looking. when country blue available ? BEST ANSWER: Thank you for your question. We do not currently have an in stock date. We hope this information will be of help to you.